If you’ve been living under a rock, Razer Inc. just announced their first Android smartphone a few days back. New smartphones get announced almost every month it seems. Several companies are jumping into the business of selling smartphones. The list even includes Google, the makers of Android itself. 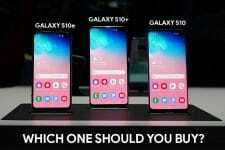 Each of these companies is trying to sell a smartphone based on what they’re best known for. So it shouldn’t surprise anyone that Razer Inc.’s Razer Phone is centered around gaming. In case you somehow missed, Razer is a company synonymous with PC gaming. They make the some of the best gaming hardware. The smartphone by Razer is interesting but what peaked our interest was the OMS Theme Engine it uses (smells like Substratum in here!). The Razer Phone is a beast from a hardware standpoint. A look at the phone and you can almost see a Nextbit Robin (the smartphone manufacturer Razer recently acquired) behind all the darkness. The sleek metal slab packs in a Snapdragon 835 couple 8 GBs of RAM and a capable 4000mAh battery. Because let’s face it, a gaming smartphone that won’t even last 4 hours without gaming is a big no-no. But those are specs that could be present in any other smartphone. This isn’t the first smartphone with a Snapdragon 835 and frankly, there have been smartphones with 8GBs of RAM before. Some of them even have a 5000mAh battery. What sets the Razer phone apart is its beautiful 5.7″ 1440p IGZO LCD display capable of a variable frame rate up to 120Hz. This means the smoothest animations ever which are quite important from a gaming perspective. To top it all off, the company even understands its user-base. Which is perhaps why they opted to go with a stock version of Android 7.1 Nougat instead of skinning it to death. There are of course a few Razer specific features which include a Game Booster and a theme store. Theme stores have become quite common on Android smartphones running skinned versions of Android. This is probably the first time somebody has included one with a stock build of Android. The jury is still out on how well the software and hardware combine together on the Razor phone. But let’s talk about the themes. 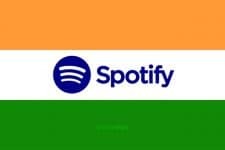 If XDA’s Mishaal Rahman is to be believed, Razer went with Sony’s Overlay Manager Service in order to allow users to install themes. An OMS based theme engine on Android smartphones is becoming increasingly common. Even something as heavily skinned as TouchWiz can now be themed using Substratum, an OMS based third-party theme engine. Sony’s open sourced service is even included in the AOSP code for Android 8.0 Oreo which can be made use of via a Substratum plugin. So an OMS based theme engine on the Razer Phone is a good news for those that are hardly satisfied with the default options. Razer’s theme engine is capable of changing system elements like quick settings and notifications as well as theming pre-built apps like the dialer, messages, the prime version of Nova Launcher, etc. Yeah, Nova Launcher Prime is the default launcher on this phone. Could this get any better? 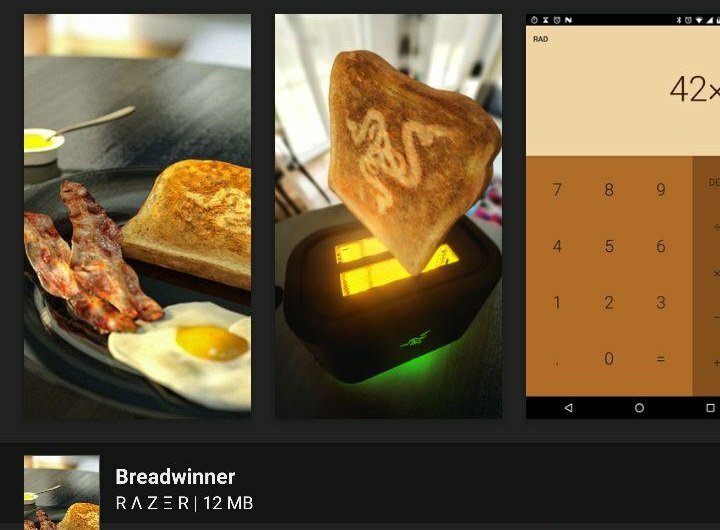 The image above is of Razer’s Breadwinner theme which, as you can see, colors the calculator app into shades of brown. Throughout this article, everything must’ve sounded good. So obviously there has been a “But” building up and now it is time you were introduced to it. Even though in theory any theme built for Substratum should work on the Razer Phone, it can’t. This is because Razer has locked down the feature to themes that are signed by the system. It should be noted though that the phone hasn’t even reached into consumers’ hands yet. Razer’s theme store isn’t even open to third-party developers as of now so users are limited to the stock themes. But there is no reason to believe that it will stay that way. 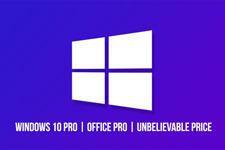 Logic dictates that Razer will eventually open up the theme store to third-party apps. As for substratum themes, just like there was a plugin for Samsung and Android Oreo devices, there probably will be one for Razer Phone as well. 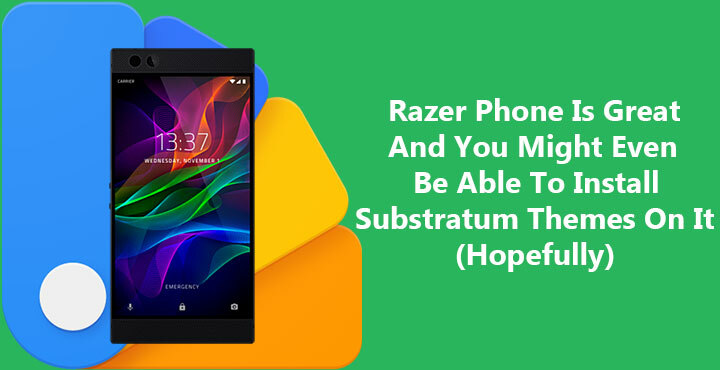 Moreover, Razer has promised to update the phone to Android Oreo which can only mean Substratum Themes can work on it using the plugin already available.